This image shows the dense fibrous connective tissue and the nonkeratinized stratified squamous epithelium that comprise the cornea. This is perhaps the simplest presentation of connective tissue and epithelium in the body, lacking blood vessels and complex epithelial derivatives (in contrast with, e.g., skin). In spite of its apparent simplicity, corneal tissues are also highly specialized for transparency and precise curvature. Corneal connective tissue, also called corneal stroma or substantia propria, consists of numerous layers of collagen fibers embedded in a glycosaminoglycan ground substance. 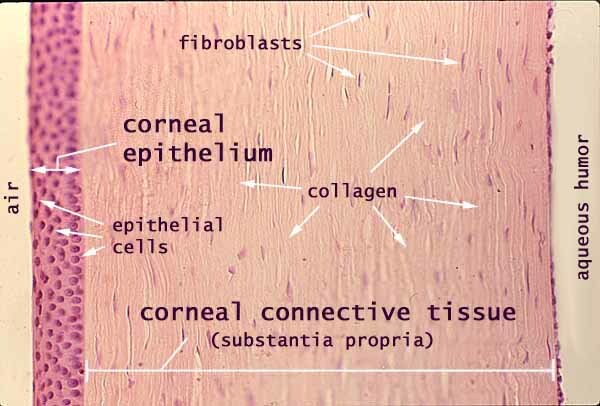 Collagen fibers are arranged into many layers parallel to the corneal surface. The fiber orientation differs from layer to layer. Scattered within the substantia propria are the flattened fibroblasts which produce the collagen and ground substance. Corneal epithelium consists of several (5 to 6) layers of cells. These cells are cuboidal through most of the thickness of the epithelium but become squamous (thin and flat) at the surface. Note that epithelial tissue is classified according to the number of cell layers and the shape of surface cells, making this a stratified squamous epithelium. Deep to the substantia propria, the single layer of cells adjacent to the aqueous humor is the so-called corneal endothelium. Specialization for transparency. Apart from the obvious absence of blood vessels, the tissue composition of cornea appears almost identical to that of the sclera (the white of the eye). But unlike the sclera, the cornea is marvellously transparent. The tissue elements of the cornea are specialized to minimize the scattering of light. Although most cells and fibers are colorless, the surfaces of these elements can scatter light when irregularly arranged. Similarly, light scattered from colorless and transparent ice crystals produce the familiar whiteness of winter snow. Such scattering (together with absorption of light by pigments such as melanin and hemoglobin) prevents light from passing freely through most tissues. The transparency of the cornea is based primarily on the regularity of its tissue components, which minimizes the scattering of light. Both outer and inner surfaces of the corneal epithelium are smooth. The collagen fibers of the substantia propria are arranged into uniform layers with parallel fibers within each layer (unlike the more irregular texture of collagen in the sclera and in the dermis of the skin). Collagen fibers are formed extracellularly, self-assembling from tropocollagen molecules (secreted as procollagen by fibroblasts). The regulatory machinery responsible for the regular arrangement of collagen fibers in the cornea remains unknown. The water content of the ground substance is carefully regulated, to maintain uniform spacing among collagen fibers. The low cuboidal cells which form the cornea's innermost layer, the so-called corneal endothelium, actively pump ions and water from the corneal ground substance into the aqueous humor, to prevent excess water from causing opacity. The cornea also displays two exceptionally thick basement membranes -- Bowman's membrane between the corneal epithelium and the substantia propria, and Descemet's membrane between the substantia propria and the corneal endothelium.